Country music fan Devin Ebert got a huge surprise at a Brett Eldredge concert and then revealed an even bigger surprise on her Instagram. 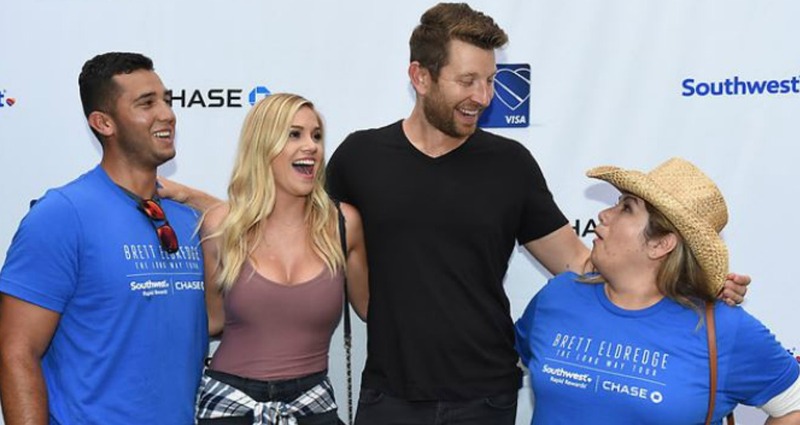 Brett Eldredge teamed up with Chase to launch the new Southwest Rapid Rewards priority card recently it was at a recent show in Los Angeles where Eldredge and Chase surprised 3 fans and invited them to join him on stage for one song. Amazing day with @Chase and @SouthwestAir. #ad Surprised fans and celebrated the launch of the #SouthwestPriorityCard! One lucky fan was named Devin Ebert and after she was brought up for the prize she took to Instagram to reveal something incredible. She and her fiance had been at the tragic Route 91 concert that happened last year. The coincidence is truly incredible since Eldredge and the Chase team picked the winners totally at random. We are sure that Brett enjoyed the meeting as much as the lucky fans did. Eldredge is currently out promoting his most recent single titled “Love Somebody” which you can listen to below.